There are lots of tools that can be a part of a healthy, growing spiritual life. Reading and meditating on Scripture. Prayer. Worship. Service. The classical spiritual disciplines. So many options. 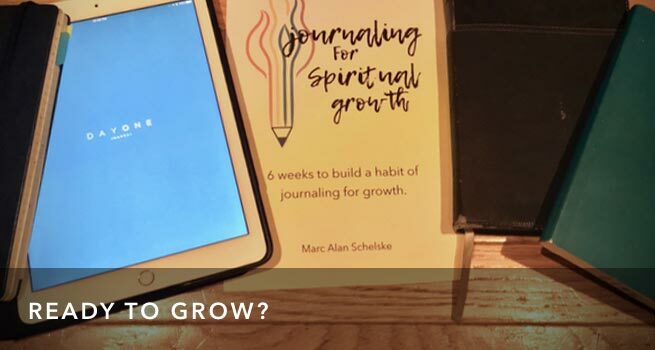 But in twenty years of helping people pursue spiritual growth, the one thing that has consistently proven to contribute to spiritual maturity is journaling. I’m not talking about keeping a diary or writing deep spiritual thoughts. I’m not talking about keeping a prayer list, or creative writing, or sitting in a coffee shop looking thoughtful. Journaling for spiritual growth is a process where you reflect on your heart, your life, and what God is doing in your journey. Journaling, because of its very nature, helps you do this most effectively. When I invite people to start journaling, I get a few common responses. Some say, “Nope, that’s not for me. I’m not a writer.” I hear you. But journaling isn’t about being a writer. It’s about learning to listen to God’s work in your life. Other say, “I tried that once. It didn’t really work for me.” I hear you. There are a thousand ways to journal. Prayer journals. Gratitude journals. Diaries. All of these have their place and purpose. But Journaling for Spiritual Growth is a specific kind of practice, and it’s something I’ve found that most people haven’t experienced. Journaling has been the most consistently life-changing spiritual practice I’ve experienced in 45 years. It has become a place in my life where I regularly hear from God, where I’m challenged and encouraged, where I learn the things I need to learn in order to grow. The people I know who have followed this same path have, almost all of them, experienced the same thing. 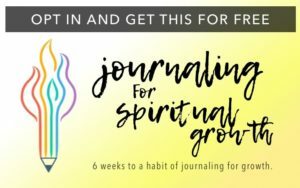 Introducing a new course: Journaling for Spiritual Growth. I didn’t plan on writing material about journaling at all. It’s just something I do, and something I recommend, but not something I’ve ever considered myself an expert in. I still don’t. But this past year, during a series of sermons, I mentioned the impact journaling has had on my life, and I started getting requests. “How is this different from…” “What’s the best way for me to do this?” “Do you have anything I can use to help me get started?” And that led to this new six-week course. I am so excited to get this into your hands. It distills the best of what I’ve learned into an easy-to-follow process that will get you started on the right track. You read my blog here because you want a deeper spiritual life. Well, this material is one of the best gifts I can give you. In six weeks, I’ll help you get started on building a long-term habit that will be profoundly impacting in your relationship with God, and personal growth. If you’re ready, subscribe now! In Week 1, we’ll talk about what journaling isn’t, and some of the reasons it might not have worked for you in the past. In Week 3, we’ll cover the essential tools and mindsets you need to make this work. In Week 4, we’ll talk about the core of journaling for spiritual growth. There are lots of ways to journal, but this core represents the vital elements that turn journaling into a spiritual practice for growth. In week 5, I’m going to give you three simple templates you can use to get started. In week 6, we’ll wrap things up talking about how to build a habit of journaling, and what to do when you miss a day. In just six weeks, you’re going to have everything you need to get started. Journaling has been a life-changing exercise for me. Many people I’ve worked with tell the same story. This practice has given me a stronger sense of personal identity. It’s led me into a deeper understanding of God’s heart. It’s been vital in helping me experience more emotional stability and a sense of peace. I’m not exaggerating when I tell you that building this habit may be the best thing you ever do for your spiritual life. It was for me. Are you ready to get started? Then Opt In to my email list, and the course will be on it’s way. If you already journal, then reflect on what elements of your current process are making a difference for you, and what elements seem to not be. Are you a journaler now? Why or why not? There are 39 comments Mind the Comment Policy.